NLC headquarters will welcome another seven councillors. Cash-strapped North Lanarkshire Council has warned that increasing the number of councillors and changing ward boundaries will cost more than £1 million. The authority condemned the Scottish Government for rubber-stamping a review of local government boundaries by the Boundary Commission. The number of council wards in North Lanarkshire will increase from 20 to 21, with the number of councillors rising from 70 to 77 despite objections from the council and residents. The changes will take effect from the local government elections in May next year. 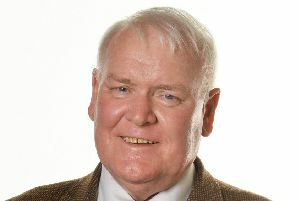 Councillor Peter Sullivan, who chaired a working group on the council抯 response to the proposals, said: “I揑t’s抯 outrageous that our serious concerns have not been listened to. It makes a mockery of having a consultation in the first place. “Traditional communities will be split and we will have another seven councillors. We estimate the changes will cost more than one million pounds. “The boundary commission claims that having these extra councillors and another ward will somehow help the poorest communities. The whole thing beggars belief. “I揑 also find it astonishing that Scottish Government ministers have accepted no changes in two other council areas because of serious objections and yet they haven抰’t taken our objections seriously at all. In an earlier post we stated the Shirrel area of Bellshill would be transferred to Thorniewood ward. However, this recommendation was rejected and Bellshill ward, which increases from three to four councillors, will take on the Fallside area of Thorniewood. We also stated that the village of Cleland would be split by new boundaries. However, this recommendation was also rejected and the village remains intact.